Obama’s Better Buildings Challenge: The Perfect Storm? Slowly but surely, something interesting is happening in the commercial building sector. 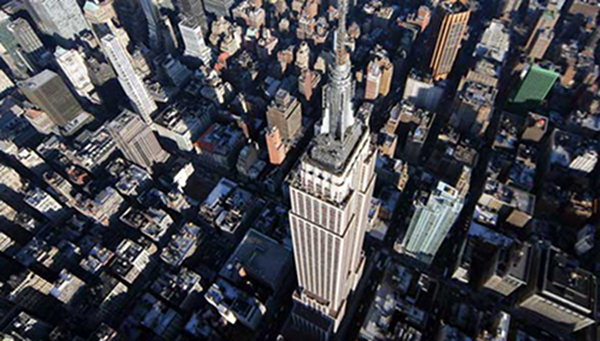 Call it the Empire State Building effect: more and more owners of large, commercial buildings have gotten the memo on how quickly energy efficient building upgrades can pay for themselves (and then make buildings less costly to operate, while drawing higher rents, happily ever after). Couple that with the increasing availability of financing for such upgrades, and you’ve got such retrofits in swing from one side of the country to another. Throw in a high-profile federal initiative like President Obama’s Better Buildings Challenge, and you just might have a perfect storm. Not long ago, we brought you word that Chicago had stepped up to this challenge, joining Seattle, Los Angeles and Atlanta in pledging to cut energy use in municipal and private commercial buildings by 20% by 2020. (Mayor Rahm Emanual plans to get a jump on that by reducing Chicago’s energy use by 20 percent across nearly 24 million square feet of public and private building space within the next five years.) Now two mega-corps, Starbucks and Staples are joining agribusiness giant J.R. Simplot in rising to meet the Better Buildings Challenge. These corporations aren’t simply signing on for the bare minimum commitment, either. Starbucks has pledged to reduce its energy consumption across 14 million square feet of company-owned stores in the U.S. by 25 percent, by 2015; Staples has pledged to cut its carbon footprint in half across its 43 million square feet of space in the U.S. by 2025; and J.R. Simplot has gone on record with a goal of increasing its energy efficiency by 25 percent across 16 U.S. manufacturing plants within the next ten years, a goal it has already achieved at three of its facilities. The idea behind the Better Buildings Challenge is not only to partner with big businesses and cities to cut the amount of energy consumed by their commercial buildings, but to establish precedents, tools and best practices that can then be used by smaller businesses and cities across the country to cut the nation’s carbon footprint as a whole. On that front, Staples has already made some moves, as it’s currently an Energy Star partner with the U.S. Department of Energy (DOE), and has employed a combination of energy efficient upgrades and green power investments to reduce its carbon emissions by 66 percent (over a 2001 baseline) as of last year. Not bad, as Triple Pundit reports that the company grew its revenue by 220 percent over the same years. Where there are businesses and municipalities ready to save energy, there are opportunities for both financial organizations (with the power to bankroll such retrofits, and benefit from the interest on loans) and companies supplying analytics (to determine which upgrades will deliver the most bang for the buck). An example of the former is Greenwood Energy (the North American renewable energy division of the Libra Group), which has signed on to the Better Buildings Challenge with a pledge to unite $50 million in financing (via its financial allies) with universities, retailers and large-scale property owners looking to develop energy efficiency projects. Currently, the DOE has garnered a total of $2 billion such commitments for the Better Buildings Challenge. An example of the latter is PG&E, a utility with a long history with eco-minded initiatives, which has joined the Better Buildings Challenge as an official “Utility Ally.” It will provide analytic support to its commercial customers — who preside over 30 million square feet of commercial building space — making it easier for them to track building energy consumption, and thereby identify opportunities to save cash and carbon.